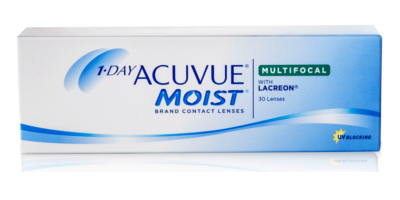 1 Day Acuvue Moist Multifocal contact lenses are the latest lenses produced by Johnson & Johnson to help wearers with Presbyopia. 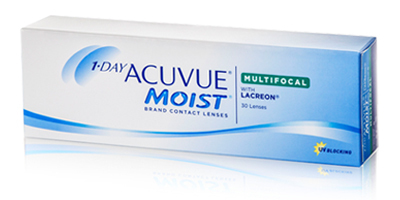 This revolutionary lens has been created with "Eye Inspired" design to meet the specific needs of the ageing eye. 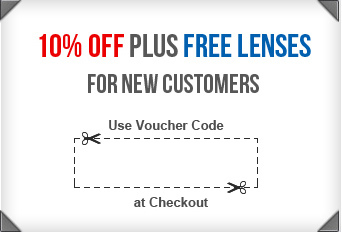 Along with Intuisight technology and a unique back curve design for Presbyopic eyes, this lens stays in place allowing crisp, clear and accurate vision. 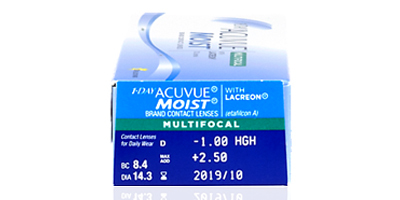 The lens is made from "Etafilcon A" material that allows higher levels of oxygen to reach your eye for longer wear times. Usage instructions:Daily wear, single use.